From 1946 to 1996, the US, UK and France detonated 318 nuclear devices in the Pacific region in the Marshall Islands, French Polynesia/Te Ao Maohi, Kiribati, Australia, the US territory of Johnston/Kalama Atoll and Amchitka Island, Alaska. Fallout was dispersed throughout the region and detected in the Cook Islands, New Zealand, Niue, Fiji, Tokelau, Samoa, Tonga and Tuvalu. In addition to nuclear detonations, the UK conducted some 600 dangerous “minor trials” in Australia, and the US tested chemical weapons, explosives and ballistic missiles in the Marshall Islands. This has left a devastating legacy of sickness, anxiety, displacement, radiation and environmental damage. The humanitarian impact extends beyond the communities most affected to the thousands of military and civilian personnel – from the USA, France, UK, Fiji, Australia and New Zealand/Aotearoa – who participated in the tests and suffered from exposure to radiation. During the 2017 negotiations of the Treaty on the Prohibition of Nuclear Weapons (TPNW), Pace University’s International Disarmament Institute assisted the International Campaign to Abolish Nuclear Weapons (ICAN) with technical advice and analysis on the “positive obligations” of the treaty: victim assistance, environmental remediation, peace and disarmament education and international cooperation and assistance. Later that year, ICAN was awarded the Nobel Peace Prize for their advocacy for the TPNW. For an analysis of the role of Pacific states in the TPNW negotiations, click here. As attention turned toward implementation, it became clear that implementation of the TPNW’s positive obligations would require renewed attention to the humanitarian, human rights and environmental impact of nuclear weapons use and testing. With funding from Friedrich Ebert Stifting’s New York Office, the Wilson Center for Social Entrepreneurship and Pace University’s Scholarly Research Grants, the International Disarmament Institute launched a research initiative on the legacies of nuclear weapons testing, focused on the Pacific region. We are in the process of preparing reports on each of the affected countries and territories, in partnership with researchers and informants in the region. In the process of doing so, we were frustrated by the lack of an open and centralized depository of key documents and statistics on Pacific nuclear weapons testing. As a result, we have begun collecting such documents here. We hope others will do the same for other regions of the world. The following provides basic indicators of harm for affected areas of the Pacific, links to the International Disarmament Institute’s reports, as well as other important documents. 28,000 Australian and New Zealand/Aotearoa troops risked exposure to radiation following atomic bombings in Hiroshima and Nagasaki, as PoWs or occupation forces. Fallout from French Pacific nuclear tests dispersed across the South Pacific region, including in Fiji, Cook Islands, Niue, New Zealand, Samoa, Tokelau, Tonga, and Tuvalu. While New Zealand government monitoring concluded that radiation “levels constituted no public health hazard“, further research is required into the human and environmental implications of fallout. Brief Guide to the TPNW: Link. Victim Assistance: Article 6(1) of the TPNW obligates states parties to provide to “individuals…affected by the use and testing of nuclear weapons…age- and gender-sensitive assistance, without discrimination, including medical care, rehabilitation and psychological support, as well as provide for their social and economic inclusion.” Article 7 obligates all states parties, as well as the UN, international and regional organizations, Red Cross and Red Crescent, as well as civil society, to engage in international cooperation and assistance to support such efforts. Harvard Briefing Paper. Environmental Remediation: Article 6(2) obligates states parties to “take necessary and appropriate measures towards the environmental remediation of areas … contaminated” by nuclear weapons use or testing. Article 7 obligates all states parties, as well as the UN, international and regional organizations, Red Cross and Red Crescent, as well as civil society, to engage in international cooperation and assistance to support such efforts. Harvard Briefing Paper. Status of signatures and ratification of the TPNW: Link. Global overview: Atomic bombs dropped on Hiroshima and Nagasaki. 2,476 nuclear devices detonated in 2,121 nuclear tests by the USA, Soviet Union, UK, France, China, India, Pakistan and the Democratic People’s Republic of Korea. Our report. Other key documents. Regional Pacific overview: 318 US, UK and French nuclear tests. Our report (in progress). Other key documents. Amchitka Island, Alaska, USA: 3 US nuclear weapons tests. 2,000 personnel involved in the tests. IPPNW report. Australia: 12 UK nuclear weapons tests at Maralinga, Emu Field, and the Montebello Islands, plus 600 ‘minor trials’ at Maralinga. Also, 16,000 PoWs and British Commonwealth Occupation Force (BCOF) soldiers exposed to radiation following atomic bombings in Hiroshima and Nagasaki. Fallout from French Pacific nuclear tests. Our report on Australia. Our report on fallout from French Pacific nuclear tests is under review and forthcoming. IPPNW reports (Emu Field and Maralinga). Other key documents (in progress). French Polynesia/ Te Ao Maohi (Non-Self-Governing Territory Administered by France): 179 French tests at Moruroa Atoll and 14 at Fangataufa Atoll. Fallout over much of French Polynesia/Te Ao Maohi. Indigenous workers employed in the clean-up of Moruroa received less protection than those in the French government’s Radiological Safety Service. Our report (in progress). IPPNW report. Other key documents. 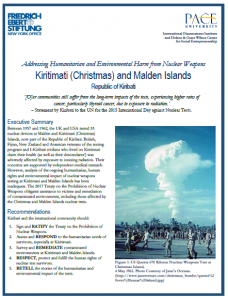 Kiribati: 33 UK and US nuclear tests at Kiritimati (Christmas) and Malden Islands; 43,000 military and civilian personnel from the US, UK, New Zealand and Fiji participated. 500 I-Kiribati civilians lived on Kiritimati during the tests; there are now 48 first generation survivors in Kiribati, plus 800 children and grandchildren of survivors. Our report. IPPNW report. Other key documents. Johnston/Kalama Atoll (US Territory): 12 US nuclear tests. Our report (in progress). Other key documents (in progress). Marshall Islands: 66 US tests in the Bikini and Enewetak Atolls. Our report (in progress). IPPNW report. Other key documents (in progress). American Samoa (Non-Self Governing Territory Administered by USA): Possibly received fallout from French Pacific nuclear weapons tests. Our report on fallout from French Pacific nuclear tests is under review and forthcoming. Other key documents. Cook Islands: Fallout from French Pacific testing. Our report on fallout from French Pacific nuclear tests is under review and forthcoming. Other key documents. Fiji: 276 veterans of UK tests in Kiribati. Fallout from French Pacific nuclear weapons tests. Our report on Fiji. Our report on fallout from French Pacific nuclear tests is under review and forthcoming. Other key documents. New Zealand/Aotearoa: 12,000 BCOF soldiers exposed to radiation following atomic bombings in Hiroshima. Troops deployed to UK test sites (11 in Australia; 551 to Kiribati). 551 New Zealand Navy sailors deployed to protest 1973 Moruoa tests. Also, fallout from US, UK and French Pacific testing. Our report on Aotearoa New Zealand is under review and forthcoming. Our report on fallout from French Pacific nuclear tests is under review and forthcoming. Other key documents. Niue: Fallout from French Pacific testing. Our report on fallout from French Pacific nuclear tests is under review and forthcoming. Other key documents. Pitcairn, Henderson, Ducie and Oeno Islands (Non-Self Governing Territory Administered by UK): Possibly received fallout from French Pacific nuclear weapons tests. Our report on fallout from French Pacific nuclear tests is under review and forthcoming. Other key documents. Samoa: Fallout from French Pacific testing. Our report on fallout from French Pacific nuclear tests is under review and forthcoming. Other key documents. Tokelau (Non-Self Governing Territory Administered by New Zealand): Fallout from French Pacific testing. Our report on fallout from French Pacific nuclear tests is under review and forthcoming. Other key documents. Tonga: Fallout from French Pacific testing. Our report on fallout from French Pacific nuclear tests is under review and forthcoming. Other key documents. Tuvalu: Fallout from French Pacific testing. Our report on fallout from French Pacific nuclear tests is under review and forthcoming. Other key documents. Wallis and Futuna/Uvea mo Futuna (French Territory): Possibly received fallout from French Pacific nuclear weapons tests. Our report on fallout from French Pacific nuclear tests is under review and forthcoming. Other key documents.